DIY robots are becoming the gateway to coding. Over the last couple of years, a new wave of cute-faced bots has taken shape to make programming languages fun for kids. Instead of dense textbooks and complex online tutorials that are designed for a more mature audience, programmable toys are built to introduce young kids to the world of code. The latest entrant on the educational bot scene is the JIMU robot, a build-your-own-bot kit from UBTECH Robotics that snaps together to form a little dancing humanoid called MeeBot, or a more elaborate elephant that flips forward on its trunk for some awkward yoga asanas. With the JIMU robot, UBTECH Robotics, a Shenzhen, China, company that has been around for eight years, is stepping into a space that's quickly getting cluttered with motorized toys. The company already has a lineup that includes industrial bots in China and commercial humanoids like Alpha 2, but now it's using its existing infrastructure to build affordable, programmable robots for kids, 8 and older, with DIY inclinations. It might also find a home in schools that are looking to adopt coding in their curriculum. The MeeBot kit, which is available exclusively at Apple stores for $130 starting today, comes with interlocking parts that include colorful blocks, connectors, motors and a rechargeable lithium-ion battery. A platinum-gray control box with a U-shaped line across the front doubles as a smiling face. Lime-green blocks make the arms, while the turquoise pieces are the legs. Bright red flat feet lend a pop of color and a personality to the robot, which can break into a jig with a single command. Six servo motors, produced in-house by the robotics company, act as moving joints along the body of the robot. The 201-part humanoid is actually the simpler build within the JIMU ecosystem. 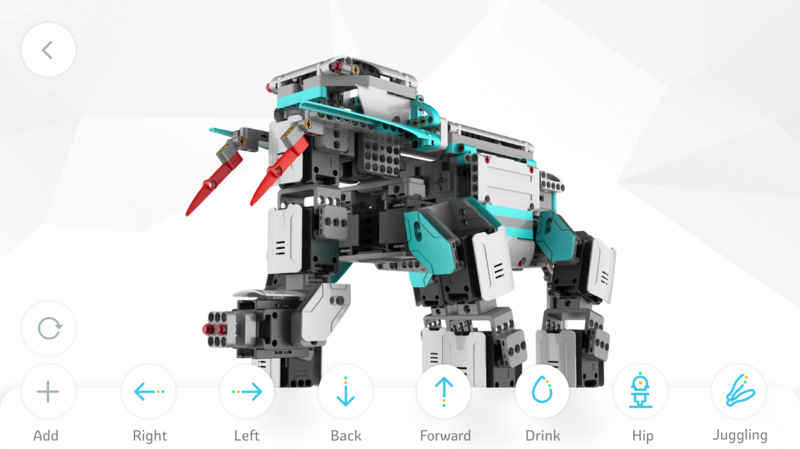 There's also the Explorer Kit, which lets you construct complex animals like a penguin, T. rex or a parrot with 372 parts, and the more advanced, 675-piece Inventor Kit. You can buy the latter on Amazon to build an elephant, giraffe or a humanoid that looks like a descendent of Optimus Prime. 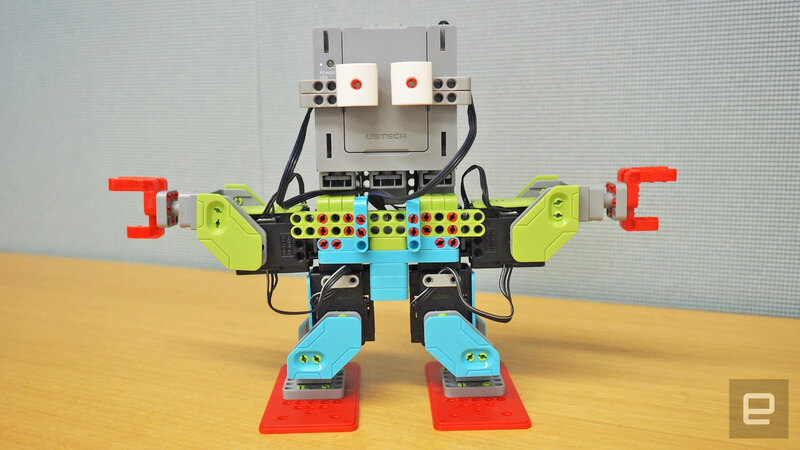 In addition to these "official characters," the JIMU robotic system makes room for creativity so that young builders can come up with their own iterations with the same blocks. The JIMU's building-block anatomy resembles LEGO's interlocking bricks. Indeed, the higher-end, 16-servo humanoid from the $400 Inventor Kit evokes memories of LEGO's flashier, laser-wielding Mindstorm robot, which sells for a similar $350. But what the JIMU's more expensive iteration lacks in flashy accessories, it makes up for with the simpler and more affordable MeeBot, which can help kids learn a coding language for a lot less money. In addition to the accessible price point, JIMU's open-source software is where its educational capabilities really shine. You can build and program the robot from the JIMU robot companion app, which is available on the Apple store and will soon launch for Android. There are step-by-step 3D animated instructions that make the construction a lot easier than working with an old-school print booklet. You can zoom in and twirl the robot's body around on the screen for 360-degree views to see how the parts interact with each other. Still, it's not as simple as building a LEGO figure. The construction, as general manager John Rhee pointed out during a recent demo, is intentionally challenging. It makes room for collaborative building between students or a parent and child. Depending on your DIY skills, after you're done building the machine, you can start programming its movements. You can pick from a list of preloaded "actions" that range from basic front-and-back movements to some "crazy dance" moves or you can come up with your own choreography through the "pose, record and playback" feature. When the MeeBot is standing still, you can move its arms or legs, reposition them and record the manual movements for the app to lay down the line of code for you. When you hit play, the robot moves the way you intended. The feature essentially takes your physical interactions with the robot and turns them into automated moves when you hit play. When you've figured out the choreography, you can work through the more advanced programming aspects of the dance routines. In a block-cording section that looks like a colorful flow chart, you can drag and drop actions, conditions and coding functionalities from a list of controls. After choosing the starting point of the program, you choose an action that will act as a trigger. The tilt of a phone to the right, for instance, can set the movement off. For the actual moves, you can choose from a preloaded list or you can design your own before bringing it into the final performance. All of this makes a user think about sequencing, order of events and even the correlation between coding and movements. For someone who wants to dig deeper into the programming of the robot, a simple tap on an icon on the top right of the screen takes you into Swift to see the breakdown of your code. While the 3D instruction set is rooted in Java, the company says it went with Apple's Swift programming language because of its simplicity. "There's a big push to bring it into the main fold," says Rhee. "Kids need to understand robotics at a young age, get their brains primed for what's coming. Swift fits into that easy coding approach." Beyond the build and the programming, another feature that UBTECH Robotics seems to be banking on is its Instagram-style social sharing. Users can share their stories, robot pictures and even how-to-build instructions through a feature in the app so others can like, comment or follow. This kind of community-building aspect seems unique within the landscape of educational robots that have been available on the market. But the ease with which you can build and program a JIMU robot is its biggest strength. A child or an adult who appreciates the DIY-robot-building activity does not need prior programming knowledge to get into it. In fact, the starter kit is an ideal starting point for anyone looking to step into the world of programming.